Monday night: Rain moves in. Heavy toward morning. Temps in the low 40s. Tuesday: Heavy morning rain tapers to mist/drizzle by early afternoon. Upper 40s to low 50s. Gusty southeast winds turn west. Wednesday: Partly sunny, windy & cold. Low to mid 30s! Wind chills in the 20s. Here we go again. Another wintry mix followed by a cold blast is coming to New England. Low pressure and moisture from the Gulf of Mexico will stream north Monday night and into Tuesday morning. 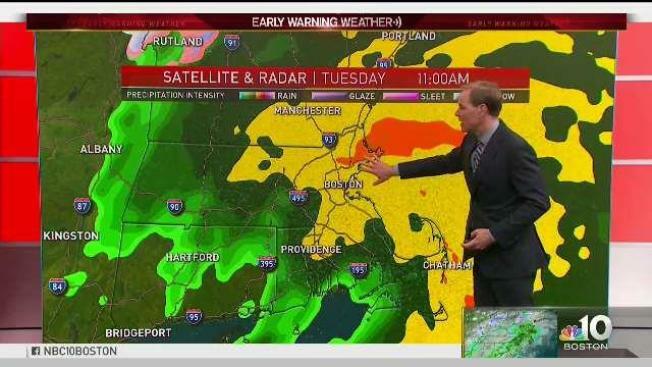 As the cold air arrives in New England, it sets up a battle zone of heavy rain and snow. Intensifying low-pressure tracks will move towards Cape Cod midday Tuesday. Rain will be at its heaviest then. Meanwhile, snow will pile up in the mountains to the north and west, with six or more inches possible. Lower elevations of northern New England will see some snow, but accumulation should be a bit less with temperatures just above freezing. In southern New England, the temperatures will rise close to 50°. A warm front may lift north of Cape Cod, getting the area to 60° with a chance of wind gust past 50 miles an hour from the south. By Tuesday afternoon, most of the rain and snow will be coming to an end. Maine, however, will continue to see rain along the coast and snow inland through sunset. Rainfall totals of 1-2 inches could cause localized flash flooding. Temperatures will cool quickly after the sun sets. We may end up with icy roads in parts of the region Wednesday morning. A very cold high pressure system will bring temperatures into the teens in the north and the 20s in the south on Wednesday morning. Although there will be plenty of sunshine, high temperatures will only reach the 30s in southern New England and the 20s in northern New England. Maine may have record low temperatures on Thursday. Elsewhere, temperatures will start in the 10s and 20s and eventually reach into the 30s. Thursday will start out sunny but turn cloudy as another storm approaches from the south. A nor'easter, with rain, snow and gale force wind, is looking more and more likely for Friday. With colder air in place, the rain and snow may make it all the way to the I-95 corridor. On Saturday, the storm will slowly clear out. Temperatures could perhaps warm to near 45° in southern New England. Another cold front comes through the region Saturday afternoon, bringing a few rain or snow showers. Cold but sunny weather will arrive Sunday and Monday. There won't be much change in the pattern, but there is the possibility for rain and snow a couple of more times before Thanksgiving.